colorthrowdown.blogspot.com , it was Color Throwdown #45-green galore, pink passion, chocolate chip. I'm pretty close and my card is pleasing to my eye. 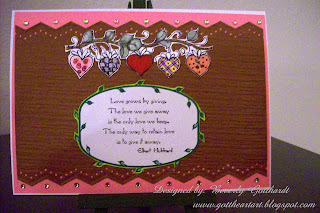 Supplies: Card Blank, 61/2" X5", Value Pack, Hobby Lobby, Stamp: not sure whose this is, but love it, Ink: Ranger Archival Ink-Jet Black, computer generated quote, Sizzix texture plate-Distressed, Martha Stewart punch, Hero Arts-adhesive crystals, Stampin Up-Blender pen, Sharpie pen-lime green, CTMH markers-Baby Pink, Bubblegum, Amethyst, Blush, Cranberry, Desert Sand, Garden Green, Citrus Leaf, Buttercup, Grey Wool, Stampin Up marker-Ruby Red. LOve those hearts---what a nice image! Thanks for playing with us! very pretty - thanks for playing!! Yummy! Love that you used a lot of "chocolate"! Thanks for playing with us! Lovely hearts across the top! Sweet sentiment too...Thanks so much for playing the CTD! How pretty!!! Love the hearts! Great job on both challenges! Thanks for playing the Throwdown--hope to see you again next time!